I sometime post my own code here so I can find an example I like in the future, rather than having to search the web. So there’s nothing extraordinary with the program below, just a good example of how to do SQL Server update commands using pypyodbc from Python. 4) If it doesn’t exist, add it with some default values for various foreign keys. filenameContainingDomainNames = "c:/Users/nwalt/OneDrive/Documents/SEOMonitor/EBN Blogs Export_NoHeader.csv"
SQLCommand = ("INSERT INTO SEOWebSite "
"(seows_userid, seows_name, seows_is_monetized, seows_is_pbn, seows_registrar_id, seows_host_id) "
One annoying thing is that the rowCount seemed to be displayed as -1 or 0, one less than what I expected. There can be many reasons for the python error “module not found”. In my case, I had a laptop with 2.7 and 3.6 both installed.? ?My windows path contained the 2.7 release, but I was running the 3.6 release.? So when I ran from the command line by just typing in “python myprogram.py” it worked.? 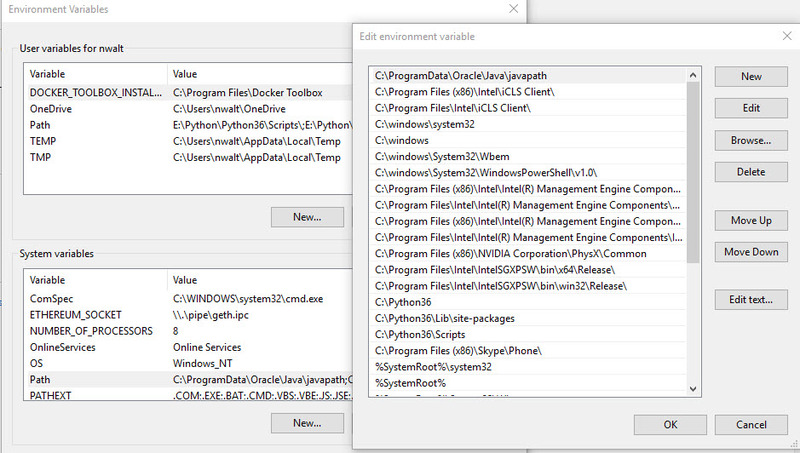 But when I tried in NotePad++, I was using Python 3.6 and getting the “module not found” error. I also needed to run “easy_install” in Python 3 on the modules that were missing (they were installed in Python 2.7 but not 3.6). So I changed the three lines that started with C:\Python27 to C:\Python36. To find the issue, I learned how to show the version of Python in the Python program itself.